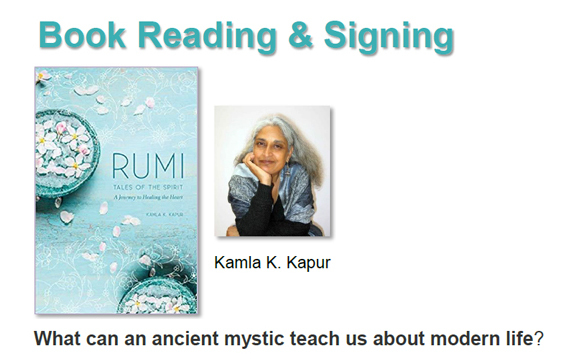 Award-winning playwright and author, Kapur K. Kapur has been studying Rumi for twenty years – interestingly, she finds he’s more popular today than ever! As a playwright, poet and professor of creative writing, she uses her own understanding of the human condition and artistic voice, along with Rumi’s stories to guide us through the trials of life and teach us to embrace suffering, to pray even when it feels hopeless, and ultimately, to surrender to the cosmic will. Here’s a short video of Kamla discussing Rumi. 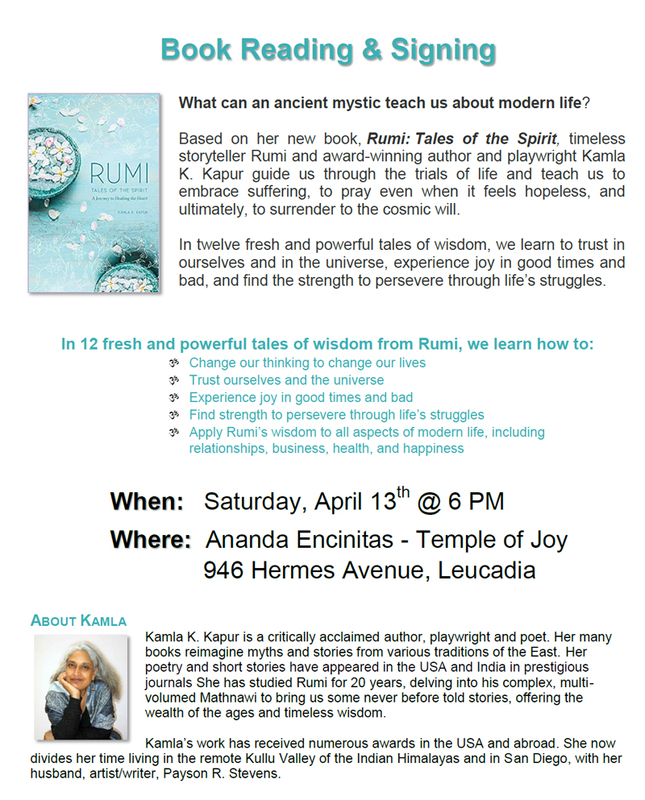 In her new book, Rumi: Tales of the Spirit (Mandala, March 2019), Kamla brings us a retelling that conveys Rumi’s deep insight on the human condition and brings to light the vast and subtle meanings of his stories that are often lost in translation. Personal, poignant, and woven with fierce passion for life and the divine, Rumi: Tales of the Spirit will leave you with heart-wrenching gratitude for life’s trials and gifts. Kamla K. Kapur is a critically acclaimed author, playwright and poet. Her many books reimagine myths and stories from various traditions of the East. 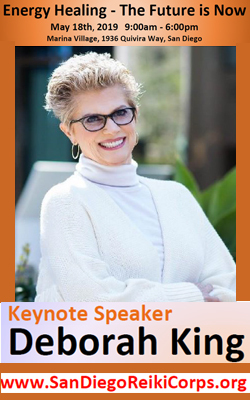 She’s received numerous awards for her work and spent fifteen years on the faculty of Grossmont College, San Diego teaching composition, literature, creative writing, mythology, and Shakespeare. She now divides her time living in the remote Kullu Valley of the Indian Himalayas and in Southern California, with her husband, Payson R. Stevens.